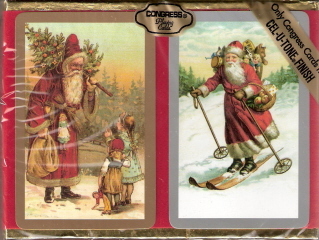 Most Congress Playing Cards never remain in print that long, and the Victorian Santa cards shown above were no exception. We can remember them being available at the very beginning of this century, but that's about the extent of my knowledge. The cards came packed in the traditional velour box - red for this two-deck set, appropriately enough - and were printed in Spain. The only technical information that we can add is Congress' model number, which is 626-02-638. This would be a nice addition to a collection of Christmas-themed playing cards or, obviously, Congress playing cards.